This is a complete list of all ships built by Electric Boat Corporation (Electric Boat Division since 1952) at their Groton, CT shipyard. Vessels built for or by Electric Boat at other yards, and overhaul, conversion, and repair contracts, are not listed. Prior to 1924 all Electric Boat vessels were built by other yards (mainly Fore River) under subcontract. The first column is the Electric Boat hull number, followed by a designation for the shipway on which the ship was built, the vessel's name, the type/size/class of the vessel, the owner/customer for the vessel, the date the vessel was delivered, and the fate or status of the vessel. The final column lists the ship's sponsor, who carried out the ceremonial christening. When the delivery date is not available, the commissioning date (noted "C") or the launch date (noted "l") is given.
" --" = built in other facilities, buildings, etc. Several EB hull numbers in this list have been skipped; these represent ships constructed at General Dynamics' Quincy Fore River shipyard during the years when that yard was under Electric Boat's management. Only two of these vessels were submarines. (SS 333) Balao Class Submarine US Navy 9 Dec 1944 Discarded 1973 Mrs. Joseph W. Williams, Jr.
(SSN 613) Permit Class Submarine US Navy C. 22 July 1966 Scrapped 1994 Mrs. Paul B. Fay, Jr.
(SSBN 617) Lafayette Class Ballistic Missile Submarine US Navy 27 June 1963 Scrapped 1994 Mrs. Valentine Hollingsworth, Jr.
(SSBN 623) Lafayette Class Ballistic Missile Submarine US Navy 23 Nov 1963 Scrapped 1994 Mrs. George W. Anderson, Jr.
(SSBN 626) Lafayette Class Ballistic Missile Submarine US Navy 9 Apr 1964 Hulked 1990 Mrs. W. Osborn Goodrich, Jr.
(SSBN 633 ) Lafayette Class Ballistic Missile Submarine US Navy C. 14 Aug 1964 Scrapped 1994 Mrs. John A. Gronouski, Jr.
(SSBN 645) Benjamin Franklin Class Ballistic Missile Submarine US Navy 16 Apr 1966 Stricken 1999; Pending Scrapping Mrs. Horacio Rivero, Jr.
(SSN 650) Sturgeon Class Submarine US Navy 5 Jan 1968 Scrapped 1996 Mrs. James L. Holloway, Jr.
Electric Boat hull numbers since 1973 are not available. Subsequent vessels are listed in approximate order by date of authorization. 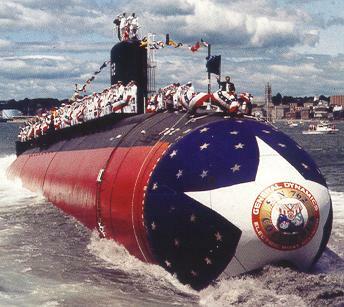 (SSN 700) Los Angeles Class Submarine US Navy C. 18 July 1981 In Service Mrs. William P. Clements, Jr.
(SSN 757) Los Angeles Class Submarine US Navy C. 29 June 1991 In Service Mrs. Glenwood Clark, Jr. Vessels Built at Groton. Electric Boat Corp. internal listing. U.S. Navy Nuclear Submarine Lineup. Electric Boat Division pamphlet. Rodengen, Jeffery L., The Legend of Electric Boat. Write Stuff Syndicate, Ft. Lauderdale, 1994.